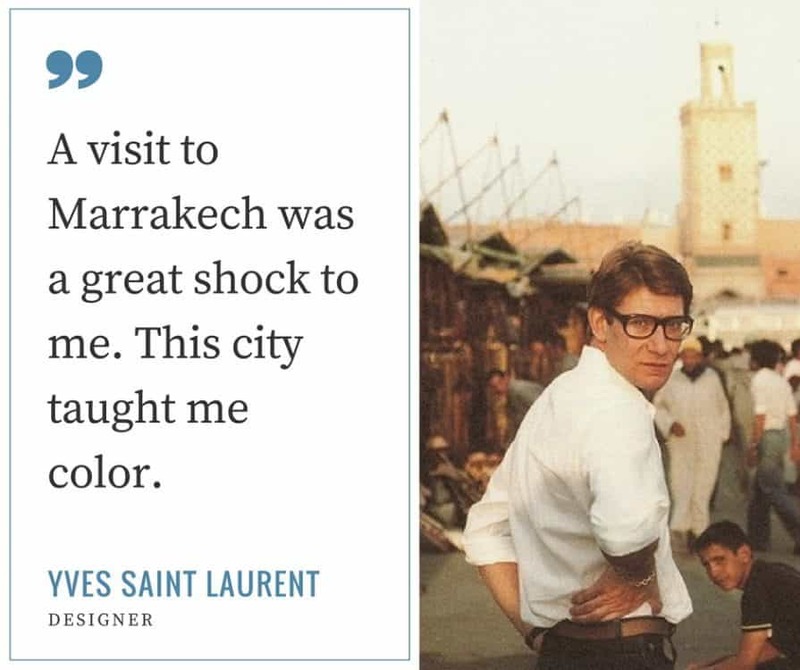 YSL Marrakech Museum has encouraged a surge of new tourists and visitors to the City, hungry to view the award-winning architecture and iconic Yves Saint-Laurent fashion design. Winning ‘Best New Public Building’ by design magazine Wallpaper* in 2018, international fashion and design-lovers are flocking in their hundreds daily, to snap a piece of the designer’s celebrated history. Alongside the already popular Jardin Majorelle, where Saint Laurent’s ashes are buried, the museum’s story and legacy reads like a further script in an already interesting biography. What’s the story behind the Museum? The Fondation Pierre Bergé – Yves Saint Laurent opened the cultural space to continue to preserve and showcase the uniqueness of Yves’s creative legacy. A permanent Yves Saint Laurent Exhibition Hall with a rotating collection from the archives and a Temporary Exhibition Hall will ensure there is always something fresh to see. Karl Fournier and Olivier Marty are the design duo behind Studio KO who have an office based in Marrakech. Previously commissioned to redesign Villa Oasis, Bergé’s Tangier home, the life and business partners were given the design brief of a building that was “strong, Moroccan, contemporary, and above all, absolutely uncompromising.” You could say those were values you could say that they aspired to in life too. The weave-like brick texture of the exterior walls is the only explicit reference to the designer. What collections can you see there? The YSL Exhibition Hall greets you with rarely seen design sketches, personal letters and photographs that piece together a colorful and committed career in fashion. Early prototypes showcase that North Africa and Morocco has as much influence on the designer as he has had on the City of Marrakech since. It’s an interesting collection of 50 pieces that reflect a liberation in womenswear and span themes of “Masculine-Feminine, Black, Africa and Morocco, Imaginary Voyages, Gardens and Art”. Photographs are not permitted in this part of the museum. The Temporary Exhibition Hall has shown a stunning painting exhibition by Jacques Majorelle, and currently is showing sculptural pieces by Moroccan designer, Noureddine Amir. In time, it will welcome rotating exhibitions across the genres of fashion, art, design, anthropology and botany. What’s the history behind the bookstore? Every piece in the museum has a reference to part of the designer’s life. The bookstore is inspired by the Rive Gauche ready-to-wear boutique and houses an impressive range of books covering Saint Laurent, fashion history, Morocco, films that inspired him, and the catalogues and books about the temporary exhibitions. This is where you can buy a piece to take home with you, if you choose. What’s the secret behind the garden? The landscape designer Madison Cox, widow of Bergé and previous friend to Saint Laurent, was commissioned by the Fondation Jardin Majorelle to promote water conservation and planting of ecologically responsible plants that are suited to the climate of the city. You’ll find Papyrus, Philodendron and the prickly pear (that looks like a cactus) among other beauties. Keep your eye out for the beautiful plants and vines that frame the neighboring buildings to the Museum too. How long will the queue take to get in? Although the queue is increasingly long to Jardin Majorelle, you can purchase your ticket to the YSL Museum in a relatively short space of time. Peak times are between 10 and 2, so you’d wise to visit late afternoon (after 4pm) or arrive before 10am so you’re first there when they open their doors. If you’re planning on visiting Jardin Majorelle too, pencil in a whole afternoon for your visit, as the queues there are on average, over an hour long each day (in the morning and afternoon). Inside the YSL Museum, there is Cafe Le Studio named after his Parisian workspace. It’s light, bright, with indoor and outdoor seating and feels calm (if you catch it off peak time!). You can get a range of teas, coffees and juices, and a changing menu of French influenced meals with local fresh ingredients. If you’re headed to the Jardin Majorelle, you can also choose to eat in their beautiful garden cafe too, though slightly pricier. There is also the local Kawa 16 and Pause Gourmand on Rue Yves Saint Laurent where you can order a good coffee or “nuss-nuss”, fresh smoothie, and light lunches or main meals. What photography tour is recommended? There’s a beautiful light on the Museum exterior before the queues arrive and after the doors close, where you can see the changing sunset colors. The tourist queue and passing taxis don’t obstruct your view of the building at these times. 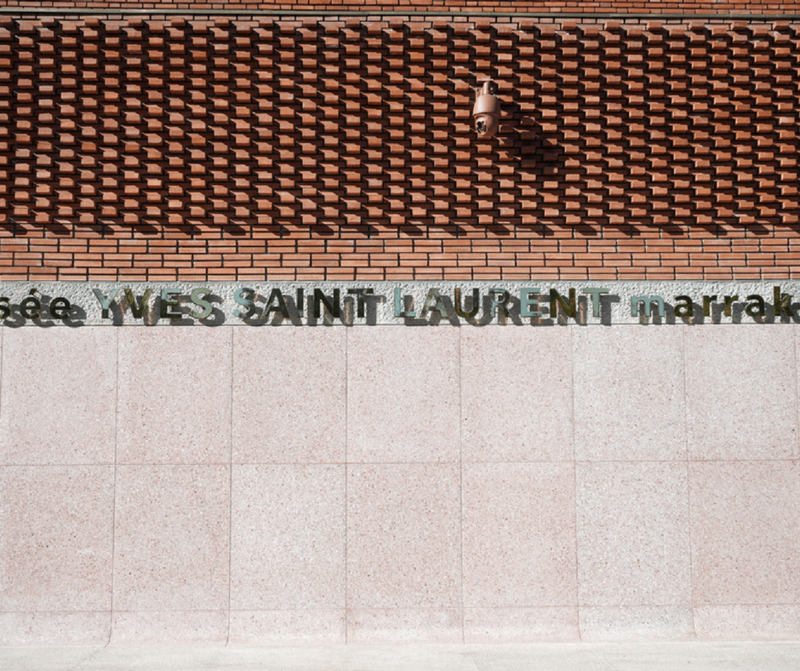 Visible 24-hours a day, the YSL logo is famously emblazoned on the entrance wall, encircled with sunlight on most days. Strike a pose for Instagram, like so many do! One of the most striking pieces of the whole museum to photograph, is the Senufo Bird African statue, majestically towering tall and against a stunning jade-colored tiled and glass wall. Within the museum itself, let your lens wander, looking for perhaps the art within the art, or better still, just be present, and soak in the memories with your eye. After your visit, you could imagine you were in the shoes of Saint Laurent (quite literally), and head down to the Jamaa el-Fna square. Snap iconic styled photos or selfies with a backdrop of locals, or if you find a traditional barber shop, why not ask permission to take a snap inside, like the iconic shot of his muse, Catherine Deneuve? The next day, you could treat yourself to a spa day at La Mamounia, where he went on his first visit in 1966, and is a favorite photoshoot location for fashionistas, travelers and Instagrammers wanting a perfect shot against the still iconic design. 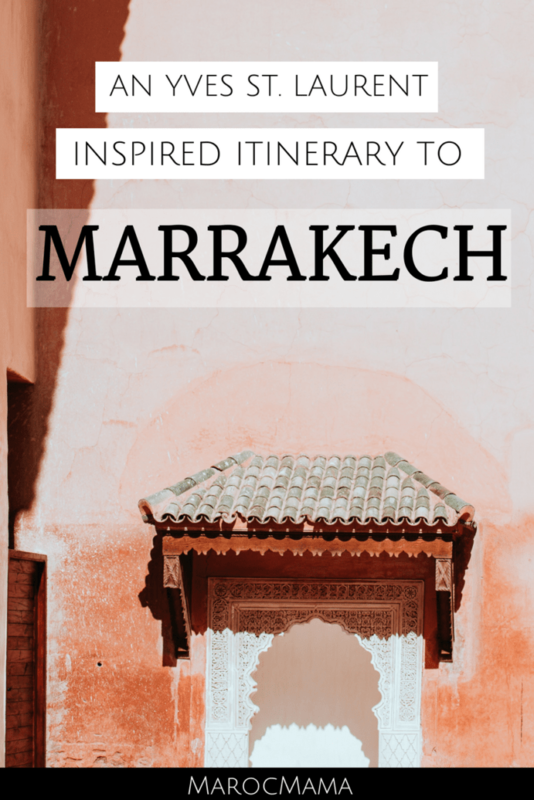 Also check out the Secret Ride from Marrakech Insiders which will take you behind the scenes of St. Laurents world. Mention MarocMama when you book for a special gift on your ride! Open daily except Wednesdays from 10:00 am to 18:00, rush hour between 10:00 and 14:00. Last admission at 17:30. 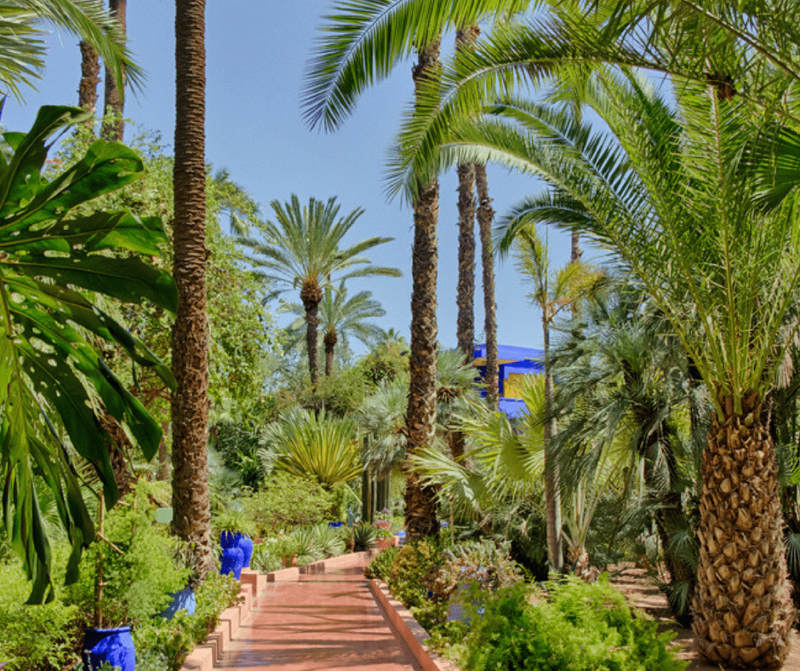 Admission is 100DH or 170DH if you combine it with Jardin Majorelle. Travel tip: when leaving the museum, you’ll be stopped by taxi-touts. They charge exuberant prices for tourists (they quote between 50DH and 100DH for what should be a 10-20DH ride per person). If you go to the end of Rue Yves Saint Laurent and turn left at the horse carriages, you’ll find petit taxis where you can request they put the counter on to give you a fair price. If they refuse, know that an average price to Gueliz is 10DH, 15DH to Kotoubia and up to 20DH to the Mellah, including tip. Marie Milligan is a writer, coach. entrepreneurship educator and founder of Wild Women Do, a resource for inspirational women wanting to realign their business and lifestyle with their wild woman, creative soul. 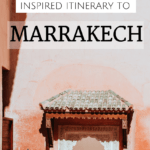 Marie has been working remotely and exploring expat-life in Morocco, since 2015.